1st Lieut., Co. K, 3d Vermont Inf. Born in Vermont, Feb., 1846. The Vermont Brigade, having received orders to attack Petersburg, moved promptly on the morning of April 2d at the given signal. After passing over about half the distance, the advancing column was exposed to a well-directed musketry fire from the front and artillery fire from forts on either side, which completely enfiladed the line and caused it to waver. This was the most critical moment throughout the entire engagement; day was just beginning to dawn, and very soon the enemy would be able to discover the precise position and movements of the assaulting column. They had been apprised of the point of attack and were apparently beginning to appreciate its importance, as they were hastening to meet it with all the strength at their command. 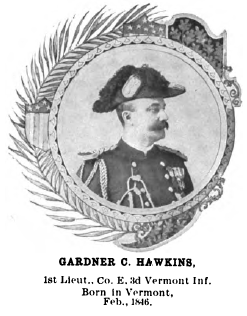 The wavering of the troops was only momentary, for there arose at the head of the column Lieutenant Gardner C. Hawkins, acting adjutant of the Third Vermont Infantry, who led his men, cheering them on, until he nearly reached the enemy’s works, when he fell, pierced by a ball which passed through his head. Following the example of the brave lieutenant, the troops again pushed on with determination. The remaining ground was passed over under a most withering fire of musketry, officers and men vying with one another in the race for the works, and losing all organization in their eagerness and enthusiasm to reach them. The line of abatis was swept away like cobwebs, and the men swarmed over the works with yells and cheers that struck terror to the fleeing rebels. Captain Charles G. Gould, of Company H, Fifth Vermont Infantry, was the first man of the Sixth Corps to mount the enemy’s works. His regiment was in the first line of the brigade, and in the charge he was far in advance of his command. Upon mounting the works he received a severe bayonet wound in the face and was struck several times with clubbed muskets, but bravely stood his ground, killing with his sabre the man who bayoneted him, and retired from the works only after his comrades had come to his assistance and routed the enemy from their lines. Born at Cavendish. Vt., Dec. 28, 1840. After crossing the works the brigade re-formed and again pushed forward with all the zeal of a victorious army, passing through thickets, swamps and pine woods in pursuit of the enemy, who were being pressed so closely that they had scarcely time to fire a shot. Again all organization was lost, and every man considered himself a host. Singly, or in squads of three or four, they charged upon whatever obstructions came in their paths. 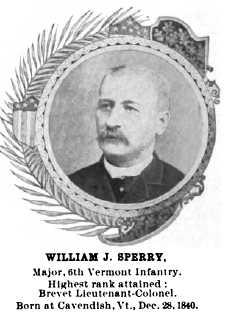 Major William J. Sperry, in command of the Sixth Vermont Infantry, assisted by a few men, captured two field guns and turned them upon the scattering rebels. Being unable to procure friction primers, the pieces were discharged by firing a musket into the vent of each. In this manner twelve rounds were fired into the enemy when a section of artillery came up and the guns were turned over to its commander.